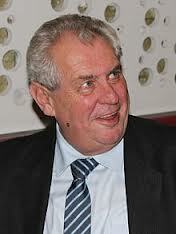 Czech Republic, new President Zeman urges early parliamentary elections. Early elections should be held as soon as possible in the Czech Republic, president-elect Miloš Zeman told Czech Television. Zeman said the center-right government is reliant on LIDEM, an offshoot of the Public Affairs (VV) Party which was never elected. PM Petr Nečas responded that the government is responsible to Parliament, not the president, and will continue as long as it holds a majority in the lower house. Zeman, a leftist candidate, won the Czech presidential elections with 54.8 percent Jan. 26, receiving half a million votes more than his conservative rival Karel Schwarzenberg. The voter turnout was 59.11 percent. Czech subsidy recipients drawing from European Union funds have so far received 407.9 billion Kč for the program period 2007-2013, which is equal to 52 percent of the total amount the Czech Republic can draw in this timeframe, the Local Development Ministry announced today. In the last quarter of 2012, successful subsidy recipients received 38.5 billion Kč worth of European subsidies. Of the total amount of subsidies paid out to recipients by the Czech Republic, the Czech Finance Ministry has asked the European Commission (EC) for the payment of 233.9 billion Kč, or 29.8 percent of the total allocated amount. The German government should not invite Zeman to Berlin due to his anti-German campaign, daily Die Welt claimed in an editorial. Zeman’s comments regarding the 1945 deportation of some 2 million Sudeten Germans from Czechoslovakia points to a language of hate that should not be tolerated in European politics, the daily wrote. Another German newspaper, Südwest Presse, referred to the president-elect as a “leftist dinosaur” who sowed fear in the minds of “little people” to get himself elected. “The Sudeten German topic is unlikely to have any political relevance for Zeman’s political practice. It just served him as a way to get to the Prague Castle,” the daily wrote. Article, The Prague Post, Jan 28th, 2013. “The enemy is the anti-civilization spreading from North Africa to Indonesia,” Zeman told a conference on European values. “Two billion people live in it, and it is financed partly from oil sales and partly from drug sales.” He went on to liken Muslims who believe in the Koran to Nazi supremacists. While Zeman and Schwarzenberg have the same goal for Europe, their views on the rest of the world differ significantly. The former premier would focus more on growing links with Moscow (SPOZ is accused of having nefarious connections to several Russian businesses), while the latter would align himself more with the United States, having shown concern over the resurgent influence of President Vladimir Putin’s Russia.